Anyone watching the news in the week leading up to the Republican National Convention has had two dire warnings drummed into them: Hurricane Isaac is headed for the city, and even if it never hits land, there’s also the bomb-throwing anarchists bound to arrive sooner or later. The weather thing, that is sort of disconcerting. Weather is unpredictable, after all. You never know when a storm will pick up, or slow down, or change directions. The anarchists, however, are not really known for their bombings. It seems like whenever the FBI unravels an instance of domestic terrorism, the plot was initiated by the FBI or one of its sketchy informants in the first place. Still, even if you know on an intellectual level that chances of a terror attack are thin at best, hearing Soledad O’Brien repeat the warning over and over, day after day, has a negative effect on your psyche. On the streets and in the Romneyville encampment, which provides shelter for both local homeless and protesters coming in from out of town, there is a minimum of paranoia, which only gets worse as the convention nears and police units start circling the camp on brand new $1,600 Kona mountain bikes. We ask one of the officers what they’re doing. “Establishing a presence,” comes the already-weary reply. However, if you spend all your time in the secure zone, either in the Tampa Convention Center, where the press has set up shop for the week, or the Tampa Bay Times Forum, the site of the convention itself, it’s almost understandable if you find yourself thanking the police, and their weaponry, and the order that they provide. The Tampa Bay Times Forum is an all-purpose arena built to house close to 20,000 people for concerts as well as hockey, basketball, and arena football games. From the outside it’s a small, typical concrete stadium. Inside, it’s not much different. One can easily picture the room being set up for Celine Dion or Kid Rock or 3 Doors Down (who actually played the RNC). When anyone speaks into the mic from the main stage, the sound spreads from huge speakers before being absorbed by the Forum; there is no echo. The RNC chairman with the unlikely name of Reince Priebus (pronounced “Rons Probeus,” “Rinse Previous,” “Arnie Prizoblewicz,” “Ringo Pryzbylewski,” and/or “Prezbo” at various points during the week, depending on how much alcohol we’ve ingested) takes the stage at 2:00 PM on Monday, August 27 and slams the well-mic'd gavel three times. The sound has a clarity and definition that can only come from the work of an expensive and knowledgeable audio engineer. It doesn't sound like the gavel from The People's Court; it sounds like a loosely coiled 808 kick drum sample. The convention is now open for business. Prezbo keeps his remarks brief, undistracted by the movement on the convention floor. At that very moment tropical depression Isaac is bearing down on Tampa, soon to be reclassified a hurricane, and turning through the Gulf of Mexico to New Orleans. Two minutes after opening the ceremony, the chairman calls a recess. Things will start back up on Tuesday. While the delegates and alternates take advantage of the unexpected day off in hotel bars and exercise rooms, the press corps is hard at work in the convention center. Wandering around Talk Show Row, one might catch Geraldo's mustache or The Herman Cain Train. As for The Verge, this is our opportunity to be brushed off for the first of many times this week by conservapundit and MSNBC contributor S. E. Cupp. When we meet him, Baker’s podcasting from a MacBook Pro with a Blue Yeti microphone. For a couple hours that day, he’s online, answering questions and, from time to time, playing pre-selected video clips. For live coverage of the convention itself, he’ll send people to the floor to stream directly from their MacBook Air webcam. "I used to be the news anchor who used a script and teleprompter and all that,” Baker says. In the past he has worked for a variety of outlets, and spent 13 years as a primary anchor at WTAE-TV in Pittsburgh. “I wanted to do live, unscripted conversation programs that were still visually interesting and [visually] oriented,” he continues. “[Live streaming] technologies let me do that." The story of The Blaze might just be the story of a new way of entering the media business (one that, at least on a basic level, has a lot of similarities to The Verge). Perhaps the lesson here is that a company like this can be profitable in a space where a traditional media operation might fail because it’s leaner, more agile, and because it can get by on prosumer and even consumer technologies like Skype. 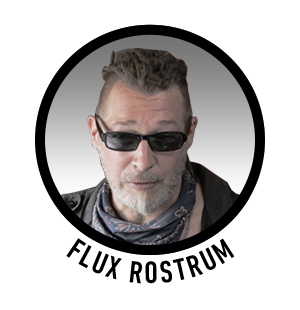 Meanwhile, back in Romneyville, a gentleman named Flux Rostrum is running a media operation of his own. We meet up with Rostrum after a rally to protest Republican-sponsored voter suppression laws in Ybor City, the part of town that owes its existence to cigar manufacturing and immigration from Cuba, Spain, and Italy. He’s in the thick of the action the entire time, filming speakers and musicians and following a spontaneous march as it moves down the neighborhood. Atop his HD camera rig is an Android phone that he identifies as a Samsung Galaxy. Everything that is being filmed is also being captured by his phone and sent to Ustream via Verizon MiFi. A couple other livestreamers also send audio and video back to the mobile studio. 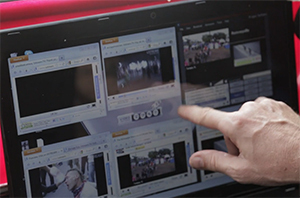 All the feeds (including webcams mounted on the bus that record what happens at Romneyville — which could prove useful if the encampment should find itself subject to a police raid) are archived on Ustream. There is also a master stream, hosted by Livestream, that is controlled by an editor on the bus and contains a mix of material from all four streams and, if nothing of any consequence is happening, original Mobile Broadcast News programming. After Rostrum is done talking to us, he’ll head to the bus to capture and edit the footage into a nine minute video for YouTube. Rostrum has been filming protests since 2001. After a couple years using L.A. as a base, he began traveling the country, looking for stories to tell. The “bus concept,” as he refers to it, allows him to always have a studio for himself and any journalists on the road who might need one — essentially, a mobile press room. "Somebody needs to be on the ground with some resources and means to get the story out from the people's perspective." The bus is useful in other ways, as well. 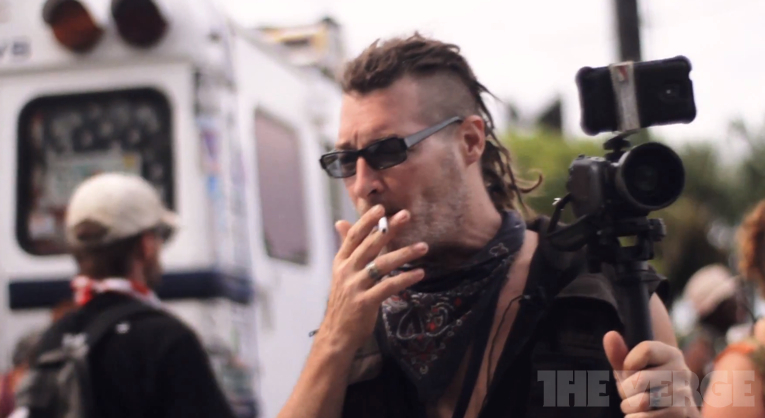 In Romneyville, tarps strung between Rostrum’s vehicle and one belonging to Food Not Bombs provide a makeshift kitchen facility for feeding protesters and neighboring homeless people. And Rostrum has satellite broadband, which in the event of an emergency can put relief workers and disaster victims in touch with FEMA.